Being in London for three months is already amazing enough because of the historic sights within the beautiful British city – but it’s amazing how far you can get with an afternoon flight out of Heathrow. 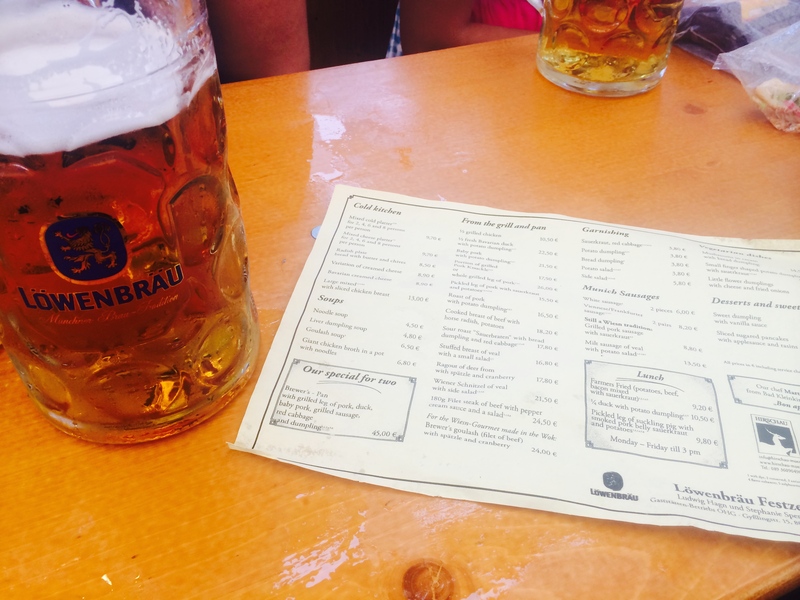 I took a weekend trip to Munich, Germany for the famous and traditional celebration of Oktoberfest. It’s crazy that in just two and a half hours of flying (with some horrible delays, but I’ll get to that later), I was in a completely different area of the world. After a rude awakening at 5 AM due to a fire alarm being set off in our dorm – I was up and trekking through the congested and crowded Waterloo station, on my way to Heathrow Airport. Despite the sardine-can-like tube I was on, the 5 Pound trip was much better than splurging on a taxi all the way there. 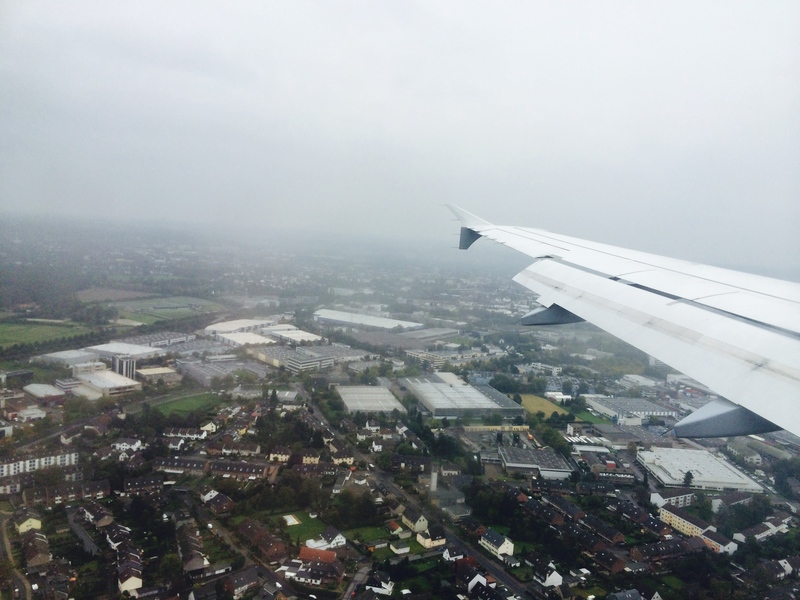 We had a few delays out of London because of planes arriving late, but finally made it to Düsseldorf, Germany where I was to catch a connecting flight to Munich. Of course, that couldn’t go off without a hitch, so we ended up on the runway for an hour, making us land way past our estimated arrival time. This usually wouldn’t be an issue, but I was meeting my Seattle friend who was coming in from Amsterdam. Let’s just say that after a few panicky conversations with the information desk, we finally found each other and we learned some international travel lessons. Whew! We made it and were so excited to see each other after a summer spent in different states and catch up on all the things that had happened. When we got to our apartment complex, we were greeted by our German roommates who we found on AirBNB. Our room was exactly as it looked on the website and we had a nice little balcony off the kitchen. The room was great and actually quite big, definitely a nice change from the small dorm room I’ve grown accustomed to in London. The best part about our new little room, was the proximity to the Oktoberfest grounds – only a short ten minute walk with a conveniently placed coffee and pastry shop on the way. If I thought that reading a few blog posts and travel tips about Oktoberfest gave me a good idea of what this weekend was to hold, then I was massively wrong. Oktoberfest is something completely different than anything I’ve ever experienced. It’s a bit like a state fair on steroids. There were rides galore and souvenir booths with immensely cheesy beer related memorabilia. Let’s get one thing out there though – who ever thought that serving massive steins of beer and then promoting roller coasters was a good idea? Just walking around the venue, you definitely saw your fair share of those who had been less than lucky with that combination. It’s incredible seeing how dedicated people are to get into their favorite beer tent. And by tent I mean an actual building, fully furnished with actual decorations. People arrived at 7 AM to get a spot at their desired tent, and while we only arrived around 10 AM – we were just fine in getting our pick of the venues. 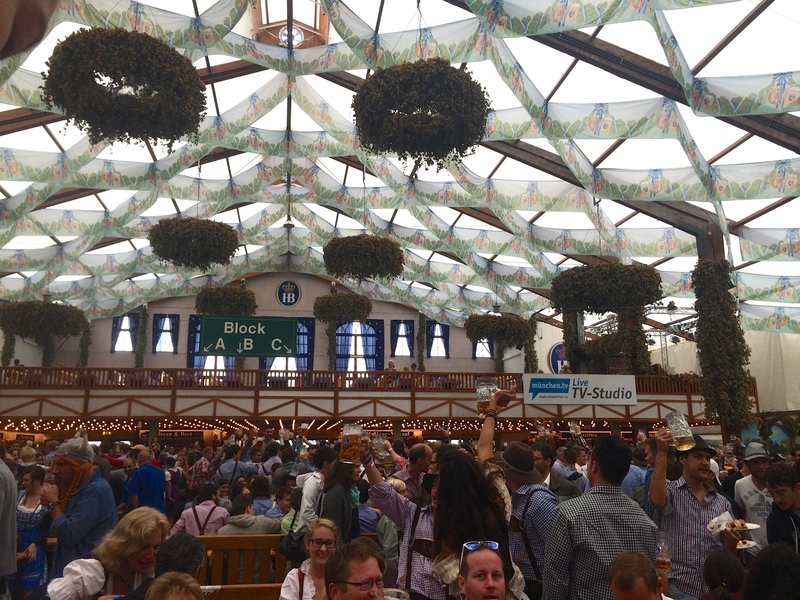 My friend and I visited the traditional Hofbräu tent where they had chandeliers made from hops and an incredible band playing dressed in lederhosen. The beer waitresses walked around holding up to twelve steins, impressing us all with their brute strength and concentration on not spilling. These rides were just a few of the more mild ones seen there. There was a large population of young families dressed in the traditional outfits, so these rides made sense for them since they obviously would not be taking their five year olds into the beer tents. The atmosphere around Theresienwiese was celebratory and full of tens of different accents and languages around, listening and chanting along to the classic German songs. The last time I was in Munich was around 12 years ago, on my very first trip to Europe with my immediate family and grandparents. 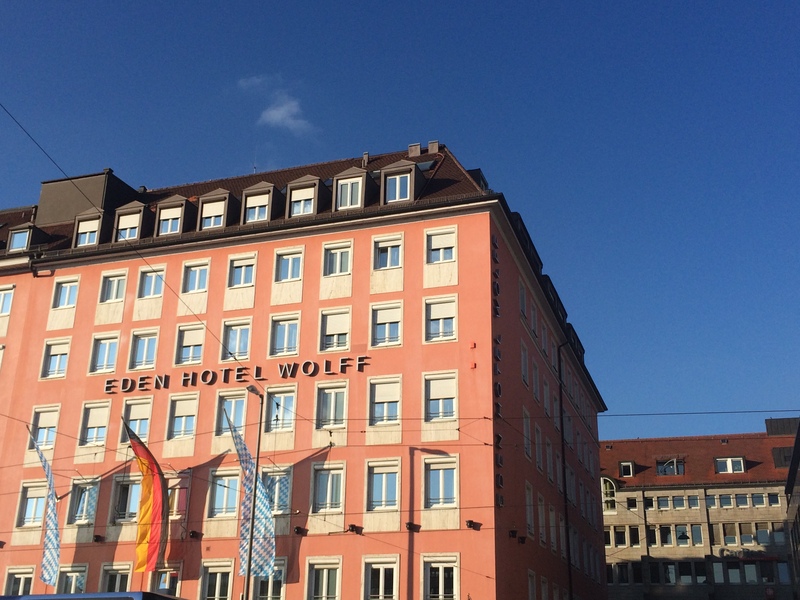 I wanted to find the Eden Hotel Wolff, where we stayed during our trip there all those years ago, and it just so happened to be right near one of the spots where we ended up for dinner. Memories came flooding back of being in the actual Hofbräuhaus in central Munich and being so overwhelmed at 8 years old, that we changed locations to the Hard Rock Cafe just across the street. It was extremely surreal reliving part of the trip that has fueled my insatiable thirst for travel. So, even though this hotel brought me back to a memory from 12 years ago, I just want to say a thank you to my grandparents who showed us the world at such a young age – it has made all the difference. We had a stein of beer, ate a bratwurst, bought corny and hilarious souvenirs and ultimately crossed one more thing off my very long bucket list. It was a quick 48 hours, but the experience was worth every ounce of stress from traveling internationally alone. I may not get back to Oktoberfest any time soon, but hopefully there will be another time in my life where I’m able to come back and see this celebration once again. Danka Laura! Love the adventures! Love the animal print, but you need a German Dirndl! Totally would have gotten the traditional costume, but it was so expensive and we got in too late the night before to go shopping. Definitely felt like an outsider in that aspect!